The ICNC Online Courses Curriculum Fellowship offers a grant of $1,300 for instructors to develop and teach an online course or curriculum unit on civil resistance. a curriculum unit on civil resistance that, at minimum, consists of 5 weekly online sessions on civil resistance in which participants are asked to review relevant session notes, videos, and readings and then engage in forum discussions moderated by a seminar instructor. develop and teach an online curriculum unit on civil resistance that consists of at least 5 weeks of content. The proposed curriculum can be offered to students and interested learners from applicant’s university, town, district, country, region. 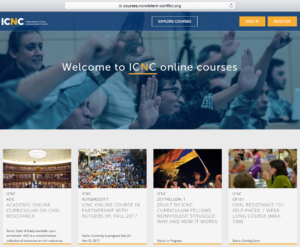 Unless it violates institutional policies, the online course or unit would be given through ICNC’s online course platform. In addition to the curriculum fellowship grant, awardees will receive ICNC staff consultation on curriculum planning, as well as a package with academic books and documentaries on civil resistance. ICNC provides these resources free of charge as part of its curriculum fellowship package to help its fellows develop the content on and teach civil resistance. The curriculum proposal should include a detailed description of the content for at least five weekly online sessions on civil resistance in which participants are asked to review a relevant session description, videos, and readings and engage in forum discussions moderated by a seminar instructor. Once the applicant is selected and becomes familiar with the ICNC online learning management system, they will set up the proposed curriculum (with any requested modifications) on the designed space within the ICNC online learning platform. In addition to the online course fellowship, ICNC also offers a curriculum fellowship for hybrid courses and for classroom courses. To learn more about the hybrid courses curriculum fellowship, please click here.